A catapult sounds like it could make for a fun ride, what with the implied image of objects flying through the air. 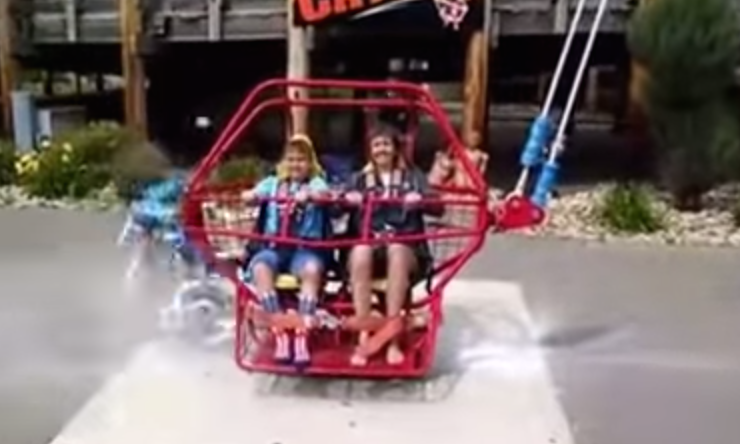 But because that flinging needs to be under control if people are going to stay safe, one Wisconsin amusement park has taken its catapult ride out of commission after a cable snapped. Even scarier, a video of the incident shows the cable failing just a few moments before the ride was supposed to shoot a woman and a boy up into the air, reports WKOW. The incident happened this week at an amusement park in the Wisconsin Dells, an area known for such theme attractions. The owners shut down the ride quickly after the cable crashed down next to the two passengers. Though the ride was open again yesterday after the owners said they’d replaced the cables, the park later closed it to investigate. Today the park managers issued a statement saying that after further review, the owner/operator of the catapult ride is required to “permanently cease operation of the ride and remove the ride” from the theme park.